Business conditions in Australia took a massive hit, China stumbles but iron ore rallies, Apple earnings not as bad as feared and 2018 was a truly shocking year for IPOs. 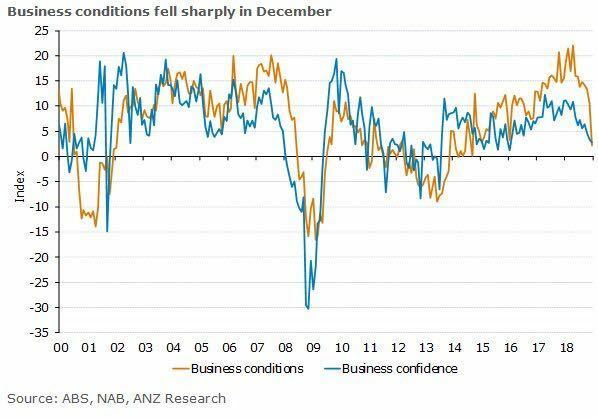 Business conditions for Australia were horrible at the end of 2018 (chart). Iron ore has rallied ~25% since mid-November despite China slowdown concerns. Apple earnings not as bad as feared, shares rally. Investors are reminded of the value of Telstra's existing network. The end of 2018 felt hard... for just about everyone! "Australian business conditions deteriorated sharply late last year, tumbling by the most since the height of the GFC. They are now the weakest since late 2014. The deterioration was broad-based across states and industries. New orders declined and business confidence remained below trend, suggesting conditions are unlikely to rebound”, according to the National Australia Bank. China is slowing but iron ore keeps rallying, go figure! No doubt you've been following the growing chorus of concerns about the sputtering growth in China. Global heavyweights in Caterpillar, Nvidia and Apple have all flagged slowing demand from China as a drag on their earnings. The iron ore price, however, has been on a tear since mid November - adding ~25%. News of another tailings dam collapse at a Vale operation has only added fuel to the fire. Apple CEO Tim Cook had tipped a bucket of cold water on expectations ahead of the much anticipated Apple result. Earnings for the December quarter were largely in line with market forecasts, however, the stock rallied suggesting that investors were preparing for worse news. Telstra (ASX:TLS) shares caught a bid yesterday (+7.77%) as TPG pulled plans on rolling out a competitive 5G network. We are often told to seek out companies with unique assets and this scenario is a reminder of how many variables can go with rolling out national infrastructure. It is almost never smooth sailing. Just take a look at the mess with the light rail project on George St in Sydney! While Telstra leaves a lot to be desired from an operational perspective the existing network is hard to replicate. Did you know 2018 was a shocker for IPOs? There were 81 IPO’s in 2018 and only 17 finished above their issue price. The average return was -17%, the median -23%. Newcrest Mining (NCM) released their quarterly report, with lower costs and significantly higher (+19%) gold production. Their Cadia operations in NSW achieved an incredible $121/oz all in sustaining costs. Air New Zealand (AIZ) announced a large profit downgrade due to issues with Rolls Royce jet engines. Previous guidance was NZD425m to NZD525, downgraded guidance is now for NZD340m to NZD400m.